I’m willing to bet that at some point over the past few years, you’ve received an email asking for a link that looked something like this one below. As ridiculous as it seems, the above link request letter and/or variants thereof land in my inbox. Every. Single. Day. If you’ve not taken the time to look at the recipient’s site carefully, and you don’t follow the link request directions, don’t be surprised when you don’t hear back hear from the recipient. If no exact instructions are given, then you have a bigger challenge. My advice is do not put the word link request in the subject line, simply because there are probably 100 million emails with that exact subject line or something similar hitting inboxes and getting deleted every day around the world. Below is a great example of a site that represents a fantastic link opportunity for those with the right content who actually follow directions. Established by Congress in 1965, the NEA (National Endowment for the Arts – https://www.arts.gov/about-nea ) is willing to link to a very specific type of content. 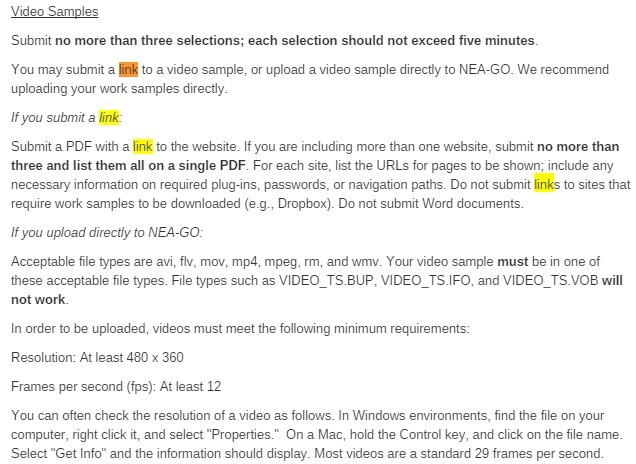 Go to the below URL or read the image below where I’ve highlighted the submission instructions. The lesson is clear: Follow instructions! 2). The site owner’s name. It seems so simple, but take the time to look through the site you are seeking a link from, and find the site owner’s name. Include their name immediately in your email, because if you don’t, chances are they will assume your email is automated spam. so he or she knows you’re not a spammer. If you can’t find their name, look for a phone number. Call them. Yes, actually use the phone. In the above link request I received, it was immediately obvious this person had never been to my site, even though the email indicated otherwise. If this person really had been to my site, my name is the first thing he or she would have seen, and after a few minutes, they would see that I don’t offer a links page. (By now the reader of the email knows you know his/her name, site name, and URL. You obviously are not lying to them or spamming them). Don’t show fake sincerity or imply friendship when, in fact, you’ve never met me. Be professional, courteous, and to the point. I really get turned off by email from people who act like we are buddies. 6). A SHORT paragraph that describes your site. Do not oversell your site or give them 76 reasons why they need to link to it. If they link to it, it won’t be your email that earned the link. The email alone cannot earn a link, but it can certainly cost you a chance to earn one. The link will come when they look at your site and determine whether or not your content is link worthy to them. 8). A valid email address and respond to any requests made to that address. “If you would like to contact me about this, please feel free to reach me at my personal email address below.” And please –PLEASE– use a real email address with a name in it. When I receive an email sent from linking-campaign@whateversite.com, I feel so special that I hit the delete key twice, just for good measure. Below is a sample of what a full link request email would look like. It’s from a long ago client but it is nearly identical to what I use successfully today. NOTE: Due to the number of people who have copied, pasted, edited and completely bastardized/ruined the example outreach email I had included here, I’ve removed it. How’s that for irony? I took the time to actually look at their site. How else could I call it by name? I reviewed the site for appropriateness. How else would I have known he had a “bird links” area? I followed any link-request instructions. How else would I have known to put “Editorial submission question” in the subject line? There are many additional subtle points to this process, and many additional things I might need or have to include, but these are not right for every scenario, so let’s keep things as simple as possible for now. The bottom line is that by recognizing the individuals on the receiving end of your link requests and showing them courtesy and respect, you have a far greater chance to get a response. When I receive link letters, I look for tell-tale signs that I was not singled out individually. If I spot an obvious bulk link seeker, I delete the email immediately. And yes, this means you cannot automate this part of the process and yes, this means you have to create and send each link request one at a time. As you should. Sometimes each site takes an entire three clicks and two minutes. Big deal. This is a lifelong link you’re seeking. Why would you short-cut this most human and crucial communication/exchange? Eric Ward founded the Web’s first service to help introduce web content to the online world, back in 1994. Then lightning struck when Jeff Bezos asked Eric to announce and publicize Amazon.com’s debut launch. Eric subsequently won the 1995 Award For Internet Marketing Excellence (the industry’s “Oscar” back then). Eric creates and has executed content linking strategies for PBS.org, WarnerBros, The Discovery Channel, National Geographic, The New York Times, TVGuide.com, Paramount, and Weather.com. 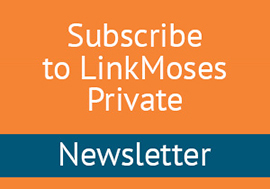 Today, Eric continues to offer link building training, workshops, strategies, and M/A counsel and publishes the content linking strategy newsletter LinkMoses Private. Eric and his methods continue to be written about in numerous publications and featured in college curricula. Eric has presented at over 160 industry conferences and symposiums. In 2015, Eric contributed to the book Success Secrets of the Online Marketing Superstars, and in 2013 Eric authored the book The Ultimate Guide to Link Building for Entrepreneur Press, now in its 3rd printing. Going back further, In 2008 Eric was one of 25 people profiled in the book Online Marketing Heroes, from Wiley & Sons, Inc., written by Michael Miller, and in 2000 contributed to the book E-Volve-or-Die.com: Thriving in the Internet Age Through E-Commerce Management. Back in the Dark Ages (1997) Eric was named one of the Web’s 100 most influential people by Websight magazine. Eric also contributes to the LinkWeek column for search industry news site SearchEngineLand.com and has also contributed to SearchEngineWatch, Web Marketing Today, ClickZ, MarketingProfs, and print magazines Search Marketing Standard and Ad Age. Eric, his wife, and three children live in the shadow of the Great Smoky Mountains in Eastern Tennessee. Eric works alone by design and prefers to take a hands-on approach with his clients. You can learn more about his link building training, workshops, strategies and other services here, and contact him here.